Cheim & Read is pleased to announce the exhibition "Joan Mitchell & John Chamberlain: A Juxtaposition." The following is an excerpt from the text by Klaus Kertess that accompanies the exhibition. "Joan Mitchell (1926-1992) was born one year before John Chamberlain. Both grew up in Chicago; she was born there, he was not. But for the delay caused by Chamberlain's stint in the Navy (1943-1946), both would, in all likelihood, have attended art school together, at the Art Institute of Chicago. Both had epiphanaic encounters with the art of Willem de Kooning and Franz Kline, in 1950; she in New York, he in Chicago. A notable white, much like that to be found in de Kooning's painting, is frequently seen in the work of both. Unlike many of their peers, both became totally committed to the powers of pleasure and transformation to be found in the hand. Both learned, early on, how to turn color into beauty's alarm clock. The sensual ellisions and collisions of contemporary poetry were an inspiration to both; she was prone to Frank O'Hara and James Schuyler, he to Charles Olson and Robert Creely. Both chose to be verbally reticent about art making and visually excessive in art making. Each knew quite early how to drink and be macho. Joan Mitchell was disposed to de Kooning via Vincent Van Gogh; Chamberlain via David Smith. Mitchell invented her own strokes and mixed her own colors. Chamberlain, for the most part, has urged himself upon readymade parts and colors – his admixture of white comes from Detroit, Mitchell's from a tube. His configurations are drawn from the ordinary acts of wadding, crushing, folding; hers from her painting-enthralled hand. Mitchell was a fervid pantheist, merging the forces of her paint and consciousness with those of nature; Chamberlain's organics are the result of more purely manmade ruminations. Mitchell was haunted by blue and mortality's "blueness"; Chamberlain is more likely to revel in the Rabelaisian. 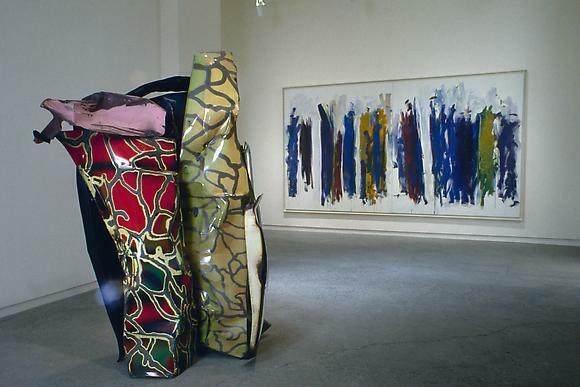 Joan Mitchell has passed away; John Chamberlain still jubilates in making."